Dr. Daniel is working with the newly created University of Washington Tumor Immunonology and Microenvironment (UW TIME) lab group, which comprises multiple faculty from the Departments of Surgery, Medicine, and Pathology. Building off previous work by lab members on the tumor slice culture model, Dr. Daniel’s primary focus is evaluating the effects of hypoxia on the cancer microenvironment, particularly the immunosuppressive effects exhibited by the stroma and infiltrating lymphocyte phenotypes. While immunotherapy has previously had limited effects on pancreatic adenocarcinoma and other solid tumors, a better understanding of the interactions between tumors as well as the spatial relationships and metabolism of cells in the tumor environment will allow combination immunotherapy to activate intratumoral T cells. She is also working on a clinical trial with her primary mentor, Dr. Venu Pillarisetty, evaluating the effects of a somatostatin analogue on leak rates after pancreatic surgery. 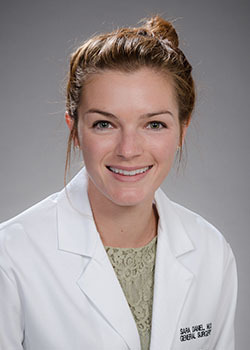 Dr. Horn is a research fellow in the T32 Postdoctoral Research Fellowship in Trauma and Burns under the mentorship of Dr. Grant O’Keefe, Professor in the Division of Trauma, Burn, and Critical Care Surgery. She will be focused on translational research, applying advances in nutrition and metabolomics to improve the outcomes and care of critically ill and injured patients, and ultimately provide more personalized therapy options. During this time, Dr. Horn will also pursue a Master of Science degree in Epidemiology through the UW School of Public Health, with a focus on clinical research methods. After residency, she plans to pursue a fellowship in trauma and critical care. Dr. Labadie is working as a research fellow under the mentorship of Dr. James Park developing an antibody–directed theranostic platform for the treatment of Hepatocellular Carcinoma (HCC). The antibody targets glypican–3 (GPC3), a tumor associated antigen serving as a unique molecular target in HCC. Their team has successfully conjugated different radiopharmaceuticals including Zirconium–89 for diagnostic immuno–positron emission tomographic imaging and Yttrium–90 for therapeutic application. In an orthotopic xenograft tumor mouse model, Dr. Labadie will further establish the efficacy of this theranostic antibody platform as a novel radiotherapeutic treatment approach to HCC. Dr. Labadie is also conducting research in the UW Tumor Immune Microenvironment (UW TIME) lab under the collaborative guidance of Drs. Venu Pillarisetty and Teresa Kim. Utilizing their tissue slice culture model, he plans to study the local immune microenvironment in pancreatic adenocarcinoma and soft tissue sarcoma with an emphasis on better understanding the role of tumor–associated macrophages (TAM) and their relationship to T–cells. He hopes to use the tissue slice culture model to study TAM–targeted therapeutics to augment and improve the efficacy of immunotherapy for pancreas and soft tissue cancers. Dr. Monu is a trainee in the NIDDK–funded T32 fellowship in Gastrointestinal Surgical Outcomes Research at the Surgical Outcomes Research Center (SORCE) under the tutelage of Dr. David Flum, Professor in the Division of General Surgery. His research will span a variety of clinical areas, however, he will primarily be focusing on diseases in the field of thoracic surgery. With guidance from Dr. Farhood Farjah, Associate Professor in the Division of Cardiothoracic Surgery, Dr. Monu plans to move forward with research on lung cancer and the implementation of screening for this disease. He will concurrently be pursuing a Masters of Public Health at the University of Washington to supplement his knowledge on research methodology. 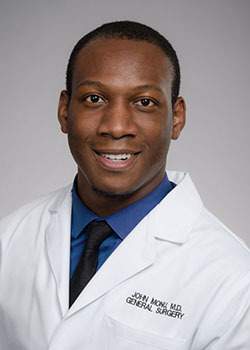 He ultimately intends to complete a fellowship in cardiothoracic surgery. Dr. Pandit is a trainee in the NIDDK–funded T32 fellowship in Gastrointestinal Surgical Outcomes Research at the Surgical Outcomes Research Center (SORCE) under the direction of Dr. David Flum, Professor in the Division of General Surgery. 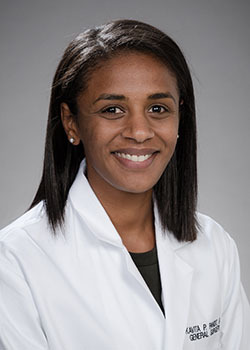 Her research interests span multiple clinical areas, though she will focus on health disparities in surgical care across a variety of settings and populations. During this two year fellowship, Dr. Pandit will also be enrolled in the Master’s in Public Health program at the University of Washington with a focus on health services. This advanced coursework will help her develop knowledge of research methodology and data analysis. She plans to eventually pursue a fellowship and career in colorectal surgery. Dr. Patel will spend two years as a research fellow at the University of California, San Francisco, in the Department of Surgery and Surgical Innovations Program under the mentorship of Dr. Michael Harrison, Professor Emeritus of Surgery, Dr. Hanmin Lee, Professor and Chief of Pediatric Surgery, and Dr. Shuvo Roy, Professor of Bioengineering. His research is funded by a National Institute of Biomedical Imaging and Bioengineering (NIBIB) R25 grant and an NIH SBIR grant. 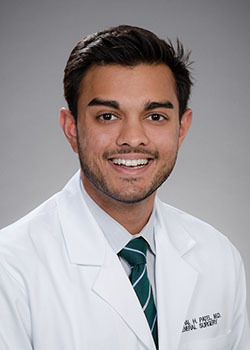 As a Surgical Innovations Fellow, Dr. Patel will focus on medical device development and be involved in a number of bioengineering and translational medicine projects including the Magnetic Duodenal–Ileal Bypass (DIPASS) clinical trial. The goal is to demonstrate that a partial proximal small bowel diversion will have similar metabolic benefits as bariatric surgery on Type 2 Diabetes and metabolic syndrome, while creating a novel, less invasive surgical intervention. He is additionally working on a number of ongoing projects further developing technology for a magnetic bowel anastomosis device in addition to a magnetic implanted device for the treatment of obstructive sleep apnea, novel approaches to seal the amniotic membrane, and less invasive therapies for the treatment of pectus excavatum. Dr. Patel plans pursue a career in academic trauma surgery and critical care at safety–net hospitals, while continuing ongoing work in medical device development and translational research. 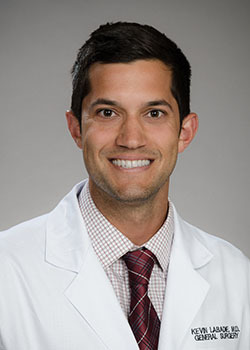 Dr. Stadeli is a trainee in the NIDDK–funded T32 fellowship in Gastrointestinal Surgical Outcomes Research at the Surgical Outcomes Research Center (SORCE) under the direction of Dr. David Flum, Professor in the Division of General Surgery. Her research will focus on health disparities and patient reported outcomes in variety of surgical populations and settings, including patients with diverticulitis, appendicitis, and traumatic injuries. She will also examine current opioid use and abuse patterns in trauma patients with the aim to identify patients at highest risk for abuse and areas for intervention. 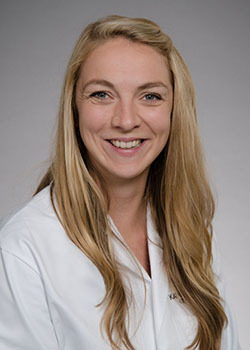 During her two year fellowship, Dr. Stadeli will also be enrolled at the University of Washington to complete a Master’s in Public Health with a focus in Health Services. 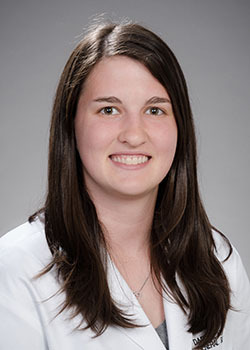 She plans to eventually pursue a fellowship in trauma, critical care, and acute care surgery. 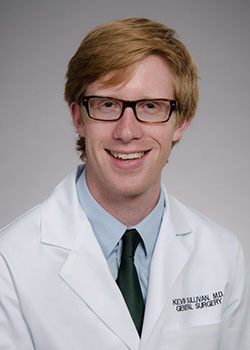 Dr. Sullivan is a Cancer Research Institute/Fibrolamellar Cancer Foundation Fellow working with Drs. Venu Pillarisetty, Associate Professor in the Division of General Surgery, Raymond Yeung, Professor in the Division of General Surgery and Kimberly Riehle, Associate Professor in the Division of Pediatric General Surgery. Fibrolamellar hepatocellular carcinoma (FL–HCC) is a form of liver cancer that is rare but occurs in otherwise healthy adolescents and young adults without underlying liver disease or cirrhosis. Surgical resection is the mainstay of treatment, and no systemic therapy or chemotherapeutic agents have proven effective; therefore, patients with unresectable or metastatic disease have a poor prognosis. Recently, a deletion on chromosome 19 that results in a novel fusion protein called DNAJB1–PRKACA was discovered and has been shown to be unique to FL–HCC. Dr. Sullivan and team will be working toward new treatments for FL–HCC by two mechanisms. First, to determine the potential for immunotherapy in FL–HCC, they will investigate the immune microenvironment of tumors using multiplex immunohistochemistry, which allows for analysis of multiple types of immune cells and their relationship with each other and tumor cells. Given that the fusion protein DNAJB1– PRKACA is located in the cytoplasm of tumor cells, it may be a target for T cells, and they plan to characterize the intra–tumoral T cells using T cell receptor deep sequencing along with isolation and culture of tumor infiltrating lymphocytes (TIL). In addition, the group plans to continue to elucidate the mechanism by which DNAJB1–PRKACA promotes tumorigenesis in the search for additional therapeutic targets.